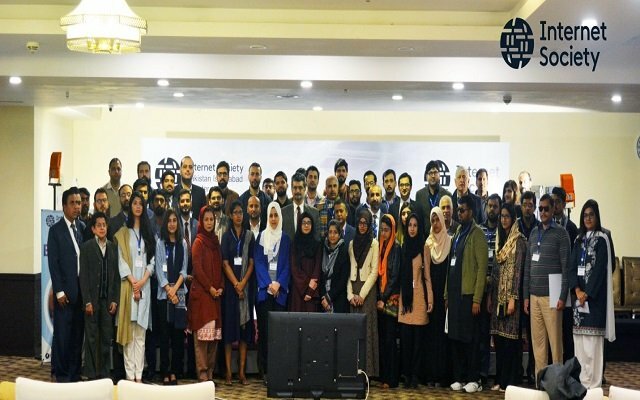 Internet Society Pakistan Islamabad Chapter (ISOC ISB) organized day long ‘Regional Forum on Digital Accessibility’ in Islamabad. The forum provided the opportunity to discuss the local policies as well as best practices for removing barriers to digital accessibility for Persons With Disabilities (PWDs) in South Asia. The forum also featured case study sessions on plausible and replicable solutions from our region as well as panel discussions on the various paradigms of digital accessibility. The forum was attended by 120 representatives of various stakeholders including ISOC chapter leaders from Nepal, Afghanistan and Sri Lanka. Mr. Waqas Hassan, President, ISOC ISB welcomed the participants and thanked the Internet Society for generously funding the event. He said that the chapter has been part of the digital accessibility initatives on the national level but this is the first time that this important issue is being discussed on a regional scale. He promised to keep up the momentum and bring together members of the community at large in order to advance and promote the vision and guiding principles of ISOC through local presence. Mr. Muhammad Shabbir Awan, Member Board of Directors, ISOC Pakistan Islamabad Chapter in his keynote address described the current situation of digital accessibility on a global, regional and national level. He stressed upon the need to adopt the global standards of accessiility on digital platforms by the Government and private sector alike. Mr Shabbir appreciated the role of the Government of Pakistan for introducing Policy measures in the Digital Pakistan Policy 2018 and also suggested that PWDs should be given representation in the recently consituted ‘Task Force on IT and Telecom by the Prime Minister’. The Chief Guest Mr. Mudassar Hussain, Member (Telecom), Ministry of IT & Telecom, stated in his remarks that Pakistan is one of the leaders on this subject, as the recently issued Digital Pakistan Policy includes a dedicated chapter addressing the needs of PWDs. He said that the digital transformation should be all-inclusive and the Government is adamant to ensure that the Policy provisions get implemented in true letter and spirit by all stakeholders. Mr. Mudassar also announced that he will recommend to the Prime Minister’s Task Force on IT & Telecom to include representation from PWDs as well. After the opening session, few successful initiatives for digital accessibility were presented as case studies, followed by panel discussion that included representation from the Ministry of IT, Telenor, Pakistan Foundation Fighting Blindness, DefTawk, ISOC Asia-Pacific. The next session focussed on the regional situation of digital accessibility where chapter leaders from Pakistan, Afghanistan, Sri Lanka, Nepal and India (over video link) discussed about their country perspectives and opportunities for regional collaboration in the future. The last session brought the PM’s Task Force on IT & Telecom, IGNITE, COMSATS and Federal Rights Commission to the table, moderated by ISOC Asia-Pacific. The Panel deliberated on the way forward for digital accessibility in an interactive dialogue with the participants that spurred thought provoking and step-wise process to make the PWDs self-sustainable and economically empowered. In his concluding remarks, Mr. Naveed Haq, Regional Development Manager, ISOC Asia-Pacific commented that digital accessibility is a priority area for Internet Society and today’s event signifies the commitment of the regional countries to the cause. He also announced that ISOC is planning to work with the Government in order to make their official websites accessible to PWDs. Mr. Parvez Iftikhar, Chair (Sub-Committee on Telecom), Prime Minister’s Task Force on IT & Telecom assured of his full support to the initiatives for the empowerment of PWDs. He also endorsed the recommendation to include representation of PWDs in the PM’s Task Force on IT&Telecom. The Forum was organized by the dedicated team of ISOC ISB chapter leaders that includes Ms. Sidra Jalil, VP, Mr. Muhammad Farhan Khan, General Secretary, Mr. Muhammad Adil Ali, Treasurer and an energetic team of young volunteers. The Forum unanimously agreed that whole-of-Government rather whole-of-society approach is the best way forward to safeguard the accessibility rights of PWDs who are our equals in talent and capability.